The large market town of East Dereham (or Dereham as it is more commonly known) lies at the exact centre of Norfolk: 15 miles east of Norwich and just off the busy A47. 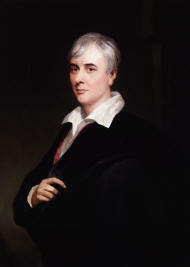 It is particularly important for its connections with the troubled poet William Cowper and the novelist/travel writer George Borrow. It was also the birthplace of the science fiction writer Brian Aldiss. The poet William Cowper is buried inside St. Nicholas' Church where, in the St. Thomas of Canterbury chapel, there is a commemorative stained glass window. It was installed in 1905 and depicts the poet in a long purple dressing gown standing next to a sofa. At his feet are his pet hares that he used to keep when he lived at Olney in Buckinghamshire. The window also contains a picture of his mother who died when Cowper was a child. And whelm'd in deeper gulps than he. However, his work was varied and also contained a number of satires such as The Sofa and humorous poems such as John Gilpin. However, many people assume that he was actually born at Dumpling Green - a hamlet just south of Dereham - although this may have been due to an error perpetrated by his first biographer Dr William Ireland Knapp. Borrow's mother Ann Perferment was certainly from Dumpling Green but it is thought that by the time of her son's birth in 1803 she was living in rented accommodation in what is now Dereham High Street. The house at Dumpling Green is quite hard to find. It lies at the end of a long unmade up road (opposite a thatched cottage with grass growing on the roof). When the track splits in two, you need take the left hand fork. There is a plaque above the door commemorating the link with Borrow. 'I love to think on thee pretty, quiet D--, thou pattern of an English country town, with thy clean narrow streets branching out from thy modest market-place, with thine old fashioned houses, with here and there a roof of venerable thatch'. 'Pretty, quiet D- -, with thy venerable church, in which moulder the mortal remains of England's sweetest and most pious bard. Borrow, who had a manic depressive character himself, would undoubtedly have felt great empathy with Cowper's debilitating fits of depression. On the wall of Church House, there is a plaque commemorating the fact that Borrow featured James Philo, the Parish Clerk of Dereham from 1779-1829, in Lavengro. Armstrong was the vicar at East Dereham from 1850 to 1888 and, during these years, he kept a diary of his daily life. He was educated at Cambridge and was the incumbent of Little Stanmore in Middlesex before moving to Norfolk. Jan 1st, 1854 - Drove to take service at Hoe in a sleigh, the snow being too deep for wheels. Had some difficulty in getting through a drift where the horse was above his knees in snow. There were 19 communicants, and I can hardly tell how they got through the snow to church. April 17th, 1859 - Buried Benjamin Tolladay at Hoe. He was nearly 100 years old - one of those righteous peasant patriarchs. With all our education and advancement, will the next generation to them be as good as they? The diaries were published in 1949 by his grandson Rev Herbert B.J. Armstrong of King's Lynn. Although not as well know as Rev Woodforde's diaries they are nevertheless an important piece of Norfolk's social history. Benjamin Armstrong is buried in the graveyard of St. Nicholas' Church. 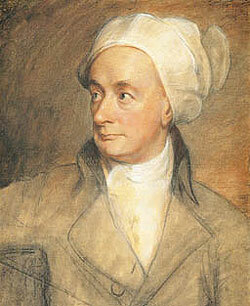 The antiquarian Sir John Fenn also lived in Dereham and was the first editor of The Paston Letters - publishing the original collection in 1787. His house, which is now the Hill House Hotel, stands at the north-east end of the town. During WW2 the American poet Hyam Plutzik was stationed at nearby Shipdham Airfield - where he worked as the Information and Education Officer for the 44th Bombardment Group of the USAAF. While based at Shipdham was inspired to write two poems about the airfield - namely Bomber Base and On the Airfield at Shipdham. However, in his first collection Aspects of Proteus - there is also an intriguing poem about Dereham. It is likely that the characters in the poem are fictional. But I know somewhere where no word goes. Or slow as the oxen and their wain. Than the track of the Celt beyond the farms. The old rose and the loving poppy. To the thicket between and what grows there. Glum John and his little brother.